A review of Losing Hearts and Minds: American-Iranian Relations and International Education During the Cold War, by Matthew K. Shannon. One of the rather incomprehensible aspects of historical scholarship on American-Iranian relations before the Islamic Revolution has been the fact that scholars have failed to shake off the perennial fascination with Mohammad Mosaddegh’s two-year term in office as Prime Minister, the ensuing oil crisis after nationalization of the AIOC, and Mossadegh’s eventual overthrow with the strong covert support of CIA and MI6 in operation TPAJAX. The coup of August 1953 might well have been America’s “original sin” in its relationship with the Iranian nation and society and indeed may be the main reason for the post-revolutionary deterioration of the bilateral relationship and the perpetual enmity between both states up to the present. But even if that were true, this would not excuse the still existing gap in scholarship with respect to this crucial relationship from the mid-1950s to the late 1970s. Indeed, a convincing argument can be made that the future of the American-Iranian relationship had not been pre-determined by the events of 1953. In fact, the political heirs of Mosaddegh’s National Front continued to hope for a (more benign) U.S. intervention in support of their democratic and liberal ideas even after the coup d’état. And in order to get to an understanding of the new phenomenon of the anti-Western religious mobilization which would turn out to be a characteristic feature of the revolution itself, this reviewer would argue that one has to investigate Iranian history of the 1960s and 1970s in particular. Given these lacunae in existing scholarship, Matthew Shannon’s study – submitted at Temple University in 2013 – has to be regarded as the ultimate study of the educational dimension of the intricate liaison between the U.S. and Iran in the post-World War Two world. Shannon, now Assistant Professor at Emory and Henry College, VA, concentrates on two related but also separate aspects of this dimension. First, he traces the U.S. involvement in, and contribution to, all educational and training aspects of Iranian modernization efforts during the Cold War up to the revolution. Second, and building on his more traditional survey of U.S. aid policies and training support in support of Iranian economic development, he additionally traces the political, societal and cultural consequences of these interactions, foremost the repercussions created through the presence of a large number of Iranian students. In the U.S. environment, which was (compared to their home country) much more liberal and open-minded, many of these students had a proclivity to engage in oppositional activities aimed at transforming or substituting Shah Mohammad Reza Pahlavi’s dictatorial rule. This binary angle on the educational contacts and interactions – what he calls the “dual function” of international education ‑ is the great strength of this study. Shannon’s narrative elegantly binds together existing scholarship on U.S. modernization efforts vis-à-vis Pahlavi Iran with the recently emerging scholarship on transnational interactions, the role of international education, scholarly and other exchanges, science policy and national security, and knowledge production in Cold War universities and its global diffusion. In a recent Bernath Lecture, Paul A. Kramer had already singled out foreign student migration as a topic whose study could help to illuminate the transnational workings of U.S. global power and encouraged further research on the intersections between student exchanges and geopolitics. Shannon’s study very much delivers on this score, as his work goes beyond the scope of earlier similar attempts; one of his main intentions seems to be to trace those episodes where transnational actors such as Iranian students based in the U.S. were in direct contact with U.S. strategic elites and policymakers and actually managed to get a hearing or even to influence U.S. foreign policy towards their home country. The author’s objective in this respect also constitutes the main difference between his study and the earlier one by Afshin Matin-Asgari (Iranian Student Opposition to the Shah. Costa Mesa, CA: Mazda Publishers, 2002. ), to which it can best be compared and which focused on the institutional and factional history of Iran’s student opposition, albeit including the Iranian student communities outside the United States. The other side of this coin is the success of U.S. global educational policy as the “fourth” dimension of U.S. strategy in the Cold War by influencing and perhaps even steering Iranian development efforts along a pro-Western and capitalist-oriented trajectory, and in “planting” U.S.-trained officials in leading positions throughout the Iranian developmental state, but also in the highest echelons of the military and intelligence services, suggesting pervasive and practically irreversible American influence. The revolution would later show how errant this belief in reality was. The American-Iranian relationship is the perfect example for a study of the influence and salience of educational networks, as the Iranian student community did indeed become the largest national group of foreign students in the U.S. during the Cold War, numbering around 50,000 in the late 1970s. Building on exemplary and extensive archival research, Shannon convincingly argues one of his main theses, that student migration made a prominent contribution to wider U.S. strategic objectives towards Iran and to the transformation of Iran into a staunch U.S. ally during the 1950s. The first chapter expands our knowledge on the myriad contributions of U.S. education efforts in support of the Shah’s program of rapid socio-economic modernization. Shannon discusses early Cold War exchange and training programs and the integration of education into wider strategic designs of the Truman administration. 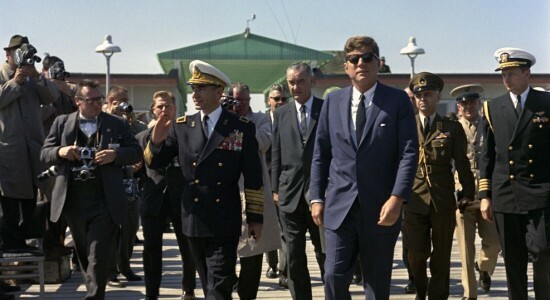 Starting with the legacy of World War U.S. training missions in Iran, foremost the military and gendarmerie advisory missions, Shannon traces the subsequent attempts to guide and steer Iranian modernization and economic development in consonance with U.S. interests. Using Smith-Mundt funds and Foreign Leader Grants, the administration established contacts and proximity to fledging Iranian elites and future stakeholders. The main focus in the 1940s and 1950s was on the military and security sectors, and the U.S. succeeded in establishing itself as the main external advisory player by successfully insisting on advisory exclusivity, forbidding the presence of other external advisory missions in this sphere, and thereby reproducing past imperialist behavior in Latin America and the Caribbean. The strong emphasis on the security establishment “paid off” during Mosaddegh’s term in office, as pro-Western officers played a decisive role in securing the success of the Coup in 1953 – one U.S. official quoted by Shannon from a House Committee hearing indeed praised the role of U.S. training of Iranian officers as “one of the most effective factors” (p. 19) in strengthening royalist leadership in the armed forces. The near-loss of Iran at that time – according to the majority view in U.S. government circles – induced a much larger U.S. aid program for Iran, accompanied by a broader educational program. The U.S. Operations Mission (USOM) administered expanded training efforts in the military, but also in technical and scientific fields with the overriding purpose of creating a modernization program that “would keep Iran independent of Soviet influence and firmly in the Western camp” (p. 23), building upon earlier agreements for technical support in the context of the Point Four agreement signed in October 1950. American-Iranian educational exchanges multiplied, and a dense network of U.S.-trained specialists in various sectors was created during that time. Shannon diligently investigates the methods used by U.S. agencies in selecting grant recipients for the programs and in drafting the syllabi of the various courses, but also the role of private educational activities, especially the work of the Ford Foundation as an incubator of the later Plan Organization, probably the most pro-American institution Iran had ever seen before and after. But the study does not overlook the many tensions and difficulties that were triggered as a consequence of growing U.S. involvement in those spheres and of interventionism in general. The “modern men” (and few women), i.e., Iranian nationalists/liberals, viewed U.S. actions in Iran much more critically after Washington’s contribution to Mosaddegh’s overthrow and the subsequent repression, which was made possible (and more efficient) due to U.S. contributions to the Shah’s security apparatus, especially the detested intelligence service SAVAK. The study shows how U.S. attempts to steer Iranian development also created conflict with the ruling classes, whose economic power base would diminish as a consequence of rapid modernization and societal restructuring, and especially conflict with the authoritarian ruler himself, who saw U.S. demands for modernization and reform as an implicit criticism of his performance as a ruler. Mohammad Reza was deeply suspicious of growing U.S. influence in the bureaucracy and foremost of American attempts to install the Plan Organization as an autonomous center of power in Iran, practically a government within the government. However, the main topic of Shannon’s study – Iranian student migration to the U.S. – still only played a marginal role at this time, but he mentions early voices in the administration already identifying this presence in 1954 as “the most important single source of American-oriented influence.” He also breaks new ground in unearthing the heretofore unknown role, at least regarding its extent, of the “private” organization of the American Friends of the Middle East (AFME) – which was in fact, as uncovered in the late 1960s and recently comprehensively examined in Hugh Wilford’s study America’s Great Game, a CIA-sponsored front organization – in targeting foreign students and in setting up and bankrolling the Iranian Student Association in the United States (ISAUS) in 1952. This involvement, which very much looks like the implementation of a well-thought-out and multi-faceted Cold War strategy using the means of international education to firmly “knit” Iran into the Western world, is shown in the narrative of the subsequent chapters to exemplify the ineptitude and futility of social engineering from abroad and of attempting to micro-manage foreign societies. The study’s second and third chapters detail the continuation of U.S. attempts to influence Iran’s developmental and political path via educational-strategic efforts during the Kennedy and Johnson administrations, but, contrary to the previous chapter, they tell a story of growing frustration and disappointment. One important strand of Shannon’s narrative are the efforts of Western-trained Iranians to influence, re-route or even transform the overall direction of Iran’s development by insisting on political reform towards liberalization and democratization as a precondition for any future success in other spheres. In this context, Shannon identifies a “transnational community of American and Iranian free speech modernists” (p.66), which he credits with exerting considerable influence on U.S. policymakers. This group consisted of oppositional Iranian students in the U.S. who had managed to take over control of ISAUS from pro-regime students in 1960 and turning the association into a center of anti-Shah activities in the U.S. and a rather limited number of U.S. establishment figures sympathetic to their cause. Most prominent amongst the latter was Supreme Court Justice William O. Douglas, a frequent traveler to Iran and old friend of the tribal elders of the Qashqai, who fervently supported the students’ cause and tried to mobilize other officials in this respect. Often counted among this group, internally (and somewhat condescendingly) referred to as “Douglasites,” was the president’s brother, Attorney General Robert Kennedy, who indeed met several times with the activist students. Shannon very much tries to revise existing scholarship on the so-called reformist interlude in American-Iranian relations under Kennedy and sees the Douglasites as the main drivers of the reformist intervention, described as having “unprecedented power of persuasion” (p. 110) at times, while traditional scholarship regarded the NSC, especially Robert W. Komer and other “action intellectuals,” as the main driving force. What this thesis lacks in persuasion is made up for in these chapters in the colorful and detailed treatment of the activities of Iranian students at U.S. universities, their ongoing conflicts and run-ins with authorities and Iranian officials in the U.S. and their growing organizational skills in facing the repressive government in Tehran. There is lots of biographical information to be found here on the lives and struggles of Iranian activist students such as the Fatemi brothers and Sadegh Ghotbzadeh, who would later become the Minister of Foreign Affairs in post-revolutionary Iran before being executed by the new Islamist masters. Much of the narrative deals with organizational details for protests against visiting Iranian dignitaries, foremost the Shah, diplomatic imbroglios caused by these protests leading to, mostly unsuccessful, calls for deportation of these students, U.S. collaboration and intelligence-sharing with SAVAK in controlling the students, and the ongoing radicalization of the student movement in light of the stabilization of the Shah’s rule since the mid-1960s. Given the much closer personal relationship between Lyndon Johnson and Mohammad Reza and growing internal stability in Iran, the reformist idea was shelved, while arms policies and regional order issues after the British withdrawal moved to the forefront. Correspondingly, the students, who were regarded as an extension of the main opposition group in Iran, the National Front, were increasingly perceived as a nuisance and a burden for otherwise excellent diplomatic relations with the Shah of Iran, an increasingly important ally in the unruly Middle East. By then, the “channel” (p. 129) identified by the author through which the students managed to influence U.S. policy had closed, even if some supporters of a reformist approach to Iran remained, such as foreign service officer William Green Miller or Senator J. William Fulbright. The study changes its vantage points in chapters four and five, leaving the previous focus on the student community against the background of American-Iranian diplomatic relations and shifting towards an analysis of the “other alliance” (Martin Klimke) formed between Iranian activist students with New Leftists from Europe and the U.S. on the one hand and the growing success of Iranian expatriates in playing a prominent part in the emerging human rights discourse during the 1970s and in succeeding in mobilizing much of international opinion and media against the repressive form of government in Iran. The new transnational alliance was facilitated by the increasing radicalization of the ISAUS, especially after the merger with their European counterpart in 1962 to form the Confederation of Iranian Students National Union (CISNU). Communist-inspired groups, often Maoist in direction, gained prominence in the late 1960s, adapting to the vernacular and protest forms of the New Left. Using the trial against the so-called “Nikkah Group,” who were accused of being behind the assassination attempt against Mohammad Reza in 1965, as their cause célèbre, the CISNU/ISAUS followers organized a worldwide network of supporters for their cause, which helped in the long term to delegitimize the Shah’s rule. In the eyes of growing parts of the public, Mohammad Reza’s repressive government became archetypical of the failures of U.S. foreign policy in support of authoritarian despots in the Third World. In turn, the Pahlavi government tried to counter the propaganda directed against it by emphasizing its economic successes, by declaring CISNU illegal in 1971, by trying to hijack and instrumentalize the human rights discourse for its own purposes – the Shah’s highly controversial twin sister Ashraf even became chairman of the UN Human Rights Commission in 1970 – and by using SAVAK cells in foreign countries to subvert and control Iranian student communities. Unsurprisingly, the latter attempts led to a series of diplomatic accidents with other governments and proved to be largely counter-productive. The last chapter then deals with the final act of (official) U.S. relations with Iran with the onset of the revolution. With the advent of a new revolutionary government, U.S. officials suddenly faced a situation where quite a number of former oppositional students based in American centers of learning ended up in high government positions and – notwithstanding their earlier treatment as a diplomatic nuisance – were quickly identified as a residual of good-will towards Washington, thereby ignoring the previous years of neglect and marginalization. With the hostage crisis and the concomitant humiliation of a superpower, however, U.S. policy towards Iran came under strong domestic pressures that made themselves felt in the treatment of the around 70,000 Iranian students living in the United States. Shannon also describes the changes occurring in the student community itself, such as the rise of the Organization of Iranian Muslim Students to the position of the most important Iranian student group in the U.S., mirroring the rise of the Islamist faction in Iran itself. In fact, quite a number of the hostage-taking students in Tehran had received their education at U.S. institutions, which in turn only helped to stoke growing anti-Iranian sentiment in American society. President Jimmy Carter and Washington, D.C. Mayor Marion Barry even reacted with issuing bans on Iran-related demonstrations in the District of Columbia in order to prevent bloodshed between pro-Khomeini demonstrators and enraged U.S. citizens. In violation of this ban, pro-Shah and pro-Khomeini protesters clashed in D.C. in the summer of 1980, an event that contributed to the ongoing deterioration in the bilateral relationship. This demonstrated once again the salience of transnational opposition by exchange students with respect to the wider relationships between states. Apart from the later chapters, Shannon’s study covers much ground that has been covered before but, by looking through the lens of international education, offers an original and unusual perspective on U.S.-Iran relations. Even if one does not agree that the student opposition exercised strong influence on U.S. foreign policy, the reader will nonetheless be convinced that this is a worthy subject for study and that the work fills many gaps in existing scholarship. It is well-argued and richly documented, and is indeed quite exemplary in this respect. Shannon makes excellent use of archival holdings in a number of presidential libraries as well as the National Archives in College Park, MD, drawing not only from State Department records, central and lot files in Record Group 59, but also from the records of the Agency for International Development (RG 469), the United States Information Agency (RG 306) and many more. He amends his source basis with records from the U.K. National Archives, numerous personal papers of officials actively involved in the events and non-governmental organizations such as the records of the Ford Foundation, or the United States National Student Association. Once it has been published as a book, future studies will definitely benefit from and build upon Shannon’s work, which sets a standard for research on international education during the Cold War. Beyond this, one of the primary contributions will certainly be the nexus established by Shannon between transnational activism and actual policymaking that is often claimed in studies of “diaspora diplomacies,” but hardly ever proven or documented with evidence. Shannon’s analysis of Iranian-U.S. transnational coalitions therefore will provide ample room for future studies and will make a major contribution to Cold War history in general. Temple University. 2013. 396 pp. Primary Advisor: Richard Immerman.